From The Asian Reporter, V17, #4 (January 23, 2007), page 13. After samurai, the mysterious ninja (also called shinobi) are the most popular characters in Eastern and Western martial-arts stories. Known for invisible stealth and the ability to infiltrate the most impregnable stronghold or silently assassinate the best-guarded targets, these nearly magical figures have captured imaginations on both sides of the Pacific. Stories about ninja have only grown with time, granting them supernatural abilities like flying, disappearing, or killing victims without seeming to touch them at all. Ten Shimoyama’s 2005 kung-fu funfest Shinobi: Heart Under Blade follows in this mythic tradition, exploiting historical fact to construct a story filled with supernatural ninjas and eye-popping special effects. While nobody should go to a movie like this expecting the epic majesty of Akira Kurosawa, any kung-fu fanatic will get his fill of action and adventure, wrapped up in a slightly preachy moralistic package and a Romeo-and- Juliet love story. This is no B-movie chop-socky fest, but a well-constructed martial-arts movie with high production values and often striking scenery, and a dash of comic-book framing and flair. At the dawn of the Tokugawa Era, after Ieayasu Tokugawa has united Japan’s feudal lords under his Shogunate, some relics of war endure. Two rival shinobi clans, used by warring lords for nefarious purposes, still remain, prevented from mutual destruction by a mutual peace treaty. This much is historical fact, or near enough, and provides the movie’s setting. But the tale departs from here into the fantastic, as the fictional Tokugawa creates a battle between these rival shinobi hamlets. By his decree, the peace treaty is eliminated and five of the best warriors from each clan must meet at his castle to battle to the death, the winner deciding which of the Emperor’s two sons will succeed him. Caught in the middle are the beautiful and deadly Oboro (Yukie Nakama) and the faux-hawk-sporting Gennosuke (Joe Odagiri), secret shinobi lovers from the two rival clans. Oboro and Gennosuke are chosen to participate in the battle and named by their rival chieftains as the leaders of their respective warriors. Anguishing over their conflict between love and duty, the two lovers offer their solutions: Oboro resigns herself to their fate, while Gennosuke suspects hidden motives behind the battle and vows to find the truth and alter their destiny. After a self-officiated wedding, providing a marital subplot to play counterpoint to the martial one, the lovers don’t spend much time pondering their classic conflict between duty and emotion. Both soon find themselves facing one another’s deadly warriors, and the real fun of the film begins. Each warrior features a unique skill, from Tenzen (Kippei Shiina), a gifted swordsman with nearly immortal healing powers, to Kagero (Tomoka Kurotani), a beautiful temptress who exhales poison gas. The variety of dazzling skills of each warrior, along with their colorful, almost cartoonish costumes, draws directly from the film’s manga roots and gives the action a touch of the gleefully superheroic. Tenzen and Kagero also act as secondary characters who encourage their reluctant leaders to battle, pushing Oboro and Gennosuke to their inevitable showdown. The outcome of this battle is both surprising and a bit didactic, resolving the opposite moral positions of their characters. As shinobi, agents of war, they must find their place in a newly peaceful Japan while preserving their individual cultures. It is this tension that lies at the heart of their Romeo-and-Juliet storyline as well as the Shogun’s deadly tournament, setting the scene for the neatly packaged ending. The strident morality of the movie, especially in the ending, strikes a discordant note, in part because few kung-fu fans like to hear sermons about war and peace. There is a similar dissonance between the syrupy, romantic love of Oboro and Gennosuke and their deadly abilities, a disconnect between the marital and martial. One of the movie’s primary flaws is that these contrary tendencies do not feel so much interconnected as mutually framed, the moral tone merely justifying the violence, and vice versa. Still, the sermonizing is not so pervasive that it undermines the martial arts mayhem, which is very entertaining if you don’t mind the lack of classic kung-fu moves and can tolerate a healthy dose of computer-generated special effects. The film, based upon the popular manga Basilisk and the Futaro Yamada book Koga Ninja Scrolls, has a built-in audience from these works, as well as from ninja fans everywhere. That crowd is sure to be pleased by Shinobi, along with anyone else who doesn’t let the high-mindedness get in the way of something much more visceral — and much more fun. 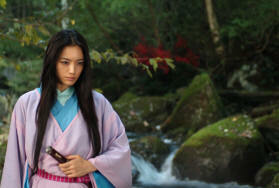 Shinobi: Heart Under Blade opens February 9 at the Hollywood Theatre, located at 4122 N.E. Sandy Blvd. in Portland. For more information, including show times, call (503) 281-4215 or visit <www.hollywoodtheatre.org>.